Kate Wood of Alchemy Fine Art Restorers has been cleaning oil paintings for well over a decade. 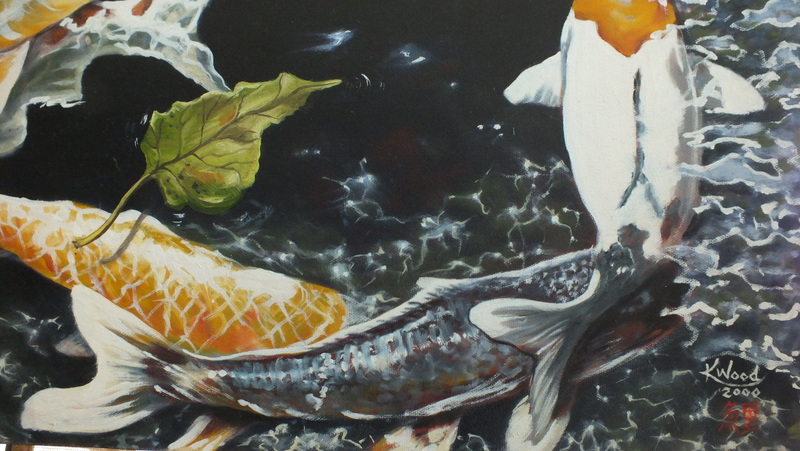 As an oil paint instructor and lifelong artist, her knowledge of paint chemistry aids in cleaning oil paintings. Kate puts the integrity of the original painting above all else. That said, the results are dramatic. 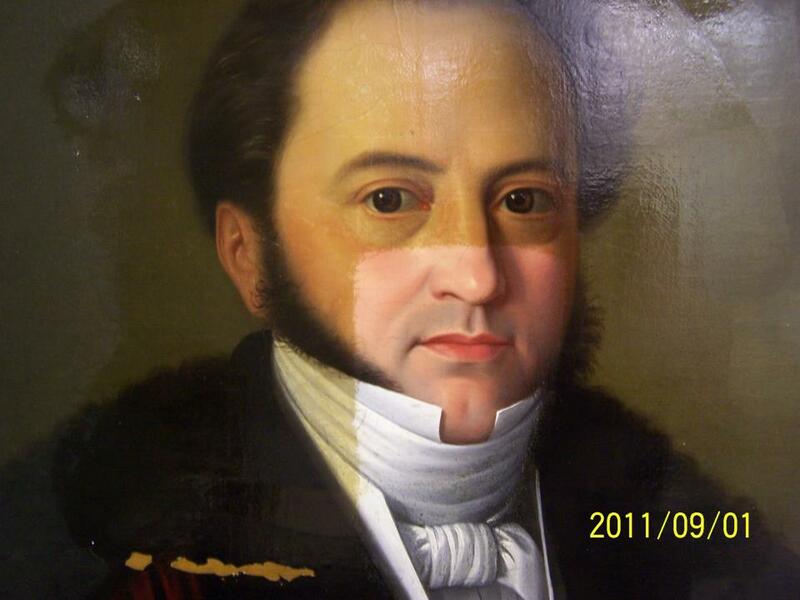 Many people think old paintings are supposed to look faded, dirty or dark. This is not the case. While furniture may benefit from patina, paintings should be cleaned carefully by an expert. 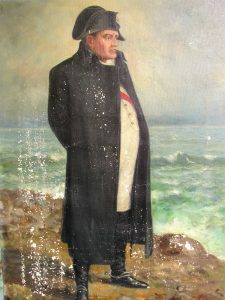 Often, the paintings she saves are a century or more old, such as this handsome gentlemen, who Kate touched up in 2011. Older paintings tend to need a complete cleaning (thus making for dramatic ‘in process’ samples), so you will find several on this site. Still, they represent only a small fraction of the paintings Alchemy Fine Art Restorers cleans. 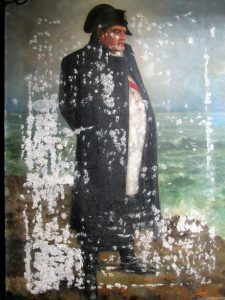 Painting in process of cleaning by Kate Wood. Alchemy Fine Art Restorers rescued a number of older pieces this holiday season. 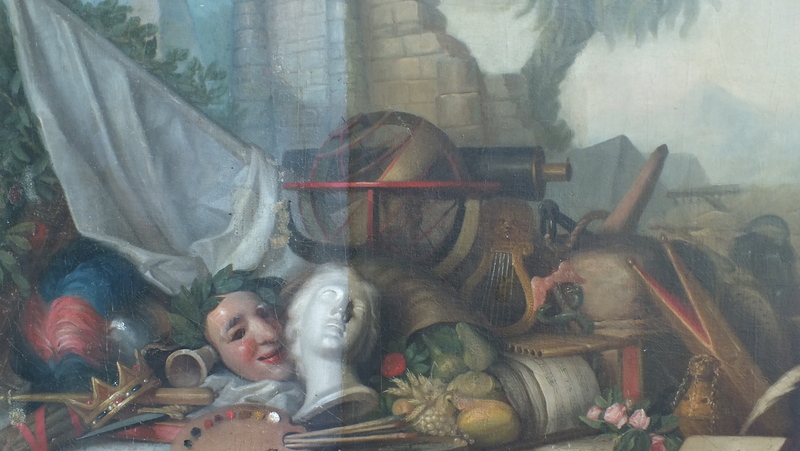 Among these recent projects, Kate Wood cleaned and restored this painting showing the emblems of the classic arts and sciences. We are always delighted when our clients ask us to restore such interesting works of art and will offer some insight into the painting whenever possible. Restoring an allegory of the arts . . . In painting, an allegory is the representation of a metaphor to illustrate complex ideas in a succinct manner. Typically, artists use allegories as symbolic devices that convey hidden meanings or hint at the moral, spiritual, or political meaning the artist wishes to convey. The technique is also used frequently in literature, drama sculpture, and the other arts, may of which are presented as the subject matter of this painting. “In any painting, as in any other work of art, there is always an idea, never a story. The idea is the point of departure, the first cause of the plastic construction, and it is present all the time as energy creating matter. The stories and other literary associations exist only in the mind of the spectator, the painting acting on the stimulus.” – José Clemente Orozco (1883-1949), Mexican painter, “New World, New Races, and New Art,” Creative Art Magazine, January 1929. You never know what you will find when cleaning oil paintings. While cleaning this early 20th century portrait of Napoleon, Kate Wood uncovered old fills that had come loose, leading to paint loss that now needed repair. 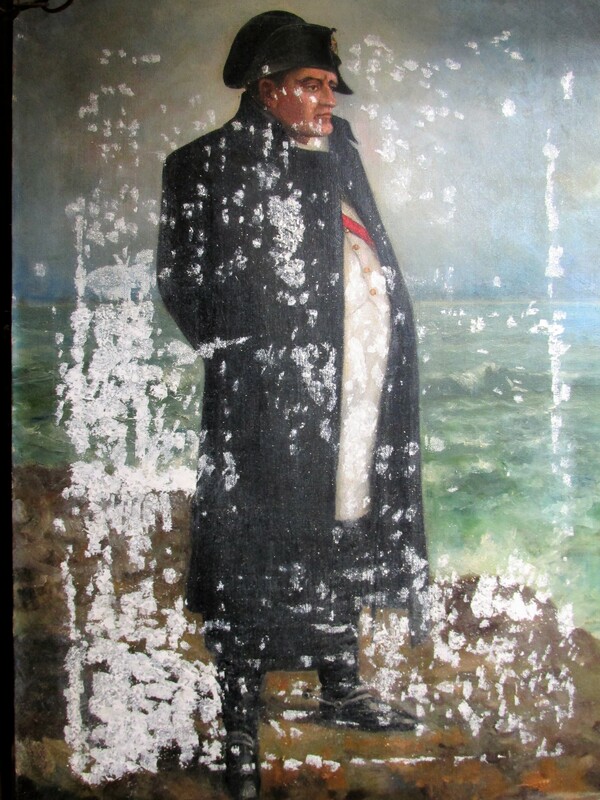 Compounding the loss, was an attempt by the owner to clean the painting with a vacuum. 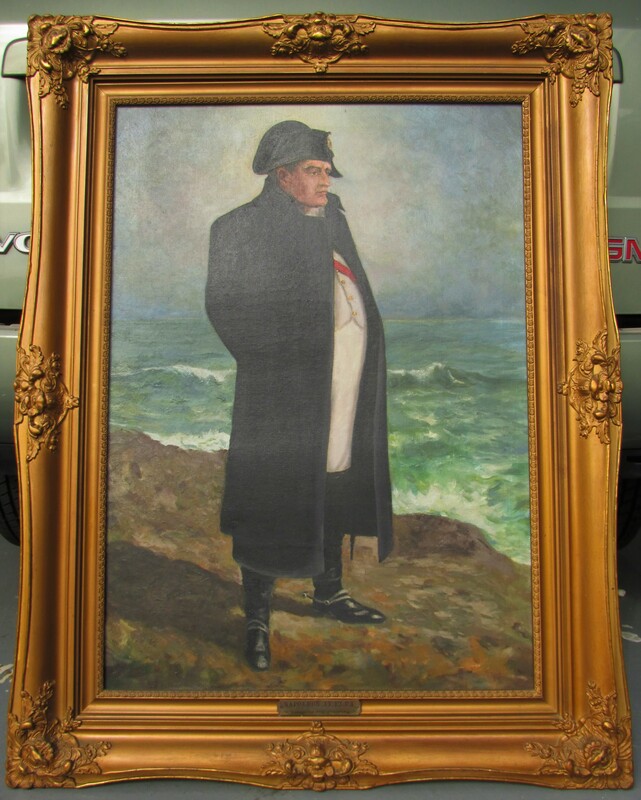 After filling the lost areas, Kate matched the original paint and restored Napoleon to his brooding glory. Lo, Alba . . . Below is the original, followed by filled-in lost areas leftover from a previous restoration, and the final, reframed and restored painting. Accidents can happen to anyone! While painting the living-room wall, a hired-hand cut some corners and accidentally dripped paint on one of Kate Wood’s own oil paintings. Kate carefully cleaned the splatter to expertly restore the painting. 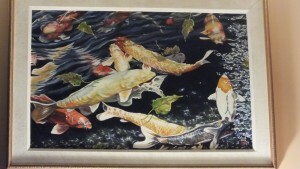 A careless contractor dribbled wall paint on this painting of Japanese koi! Kate’s painting of koi fish needed cleaning. A closeup of a dribble! It’s like it never happened: an example of oil paint cleaning. 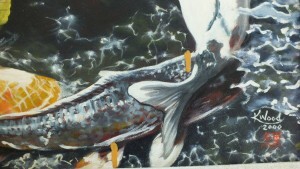 Closeup of the restored painting. 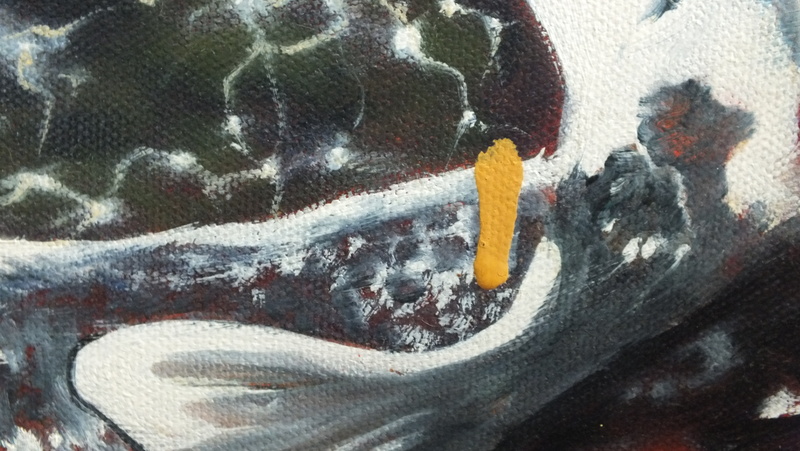 We hoped you enjoyed these examples of oil paint cleaning from Alchemy Fine Art Restorers. For more amazing saves, browse the blogs for Alchemy Samples. In particular, see The Sailor’s Return. 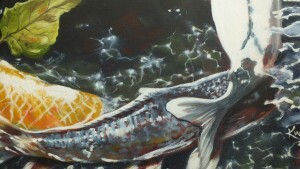 Owner: Kate Wood; Phone: (772) 287-0835; Email: katewoodartist@comcast.net.